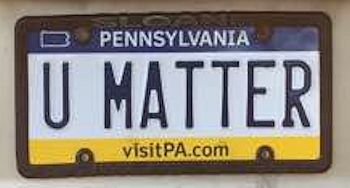 As some of you know, after last year’s Marathon I ordered a custom license plate that read “U Matter” as another way of spreading our message. I never could have predicted how that license plate would lead to the most unexpected blessings. A dear friend, Paul, was in his last days of life after a three-year battle with cancer. He was receiving hospice care at home. 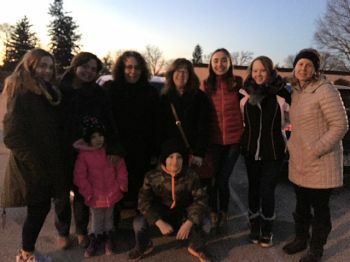 I pondered what I could offer beyond prayers, food, and flowers to support Paul and his extraordinary wife, Julie, through this tender passage. One morning, when Julie told me the hospice nurse said Paul would likely be gone by Christmas, I thought how lovely it could be for him to hear Christmas carolers one last time. But without any relationship with a choir, I had no idea how to make this happen. Hours later, as I was walking from the drugstore back to my car, a woman approached me, introduced herself as Laura, and said she had seen my car and the “U Matter” license plate around town. She said the words touched her deeply each time she saw them. In fact, once she was driving with her teenage daughter who was going through a hard time, and when they saw the license plate it prompted an important discussion between them about mattering. They took it as a positive sign that things would get better. I said, “Well, if you like the license plate, you’ll love this” and I handed her a You Matter card. Laura’s face lit up. Then when she told me that she’s on the board of our local Meals on Wheels, I told her about the You Matter Marathon and pulled out a bag of 450 You Matter cards from my car. I suggested that she distribute them to the Meals on Wheels clients. Her eyes grew wide, her smile radiated. I could hardly speak. So we hugged instead. Two days later eight people whose names I don’t know but whose faces and voices I’ll never forget, gathered in front of Paul and Julie’s home and sang Christmas carols, starting with Deck the Halls. Julie opened the living room windows so Paul could see and hear the holiday serenade. They both wiped tears from their eyes. Paul died six days later. The You Matter magic is real. This beautiful story so touched my heart and made me cry. What is the ‘U matter’ movement? I would love to learn more about it. Thank you, Gabriele. The You Matter movement is an invitation to give out You Matter cards during November. You can learn more at http://www.youmattermarathon.com. We have a few packs of You Matter cards left so you are welcome to sign up. Then I’ll send you 30 You Matter cards for free for you to share. (While supplies last). Yes, it was indeed a beautiful and magical experience. Thank you. Cheryl – Thanks for sharing that Awesome idea! I love how it touched everyone in such a meaningful way. I know it touched me just reading about it. Oh and Cheryl – U MATTER too! Thank you for your kind note, Paula. Thank you for this very touching entry. For others information in the future, there is a volunteer choir that does this type of bedside singing. Threshold Choir – check it out online to look for a choir near you. Thank you for your note. Yes – I am aware of Threshold and the amazing work they do. Such a blessing.